The cool new Elephantrunk by Architectural Mailboxes is an innovative home parcel drop box that collects multiple packages securely inside to keep them safe from weather, thieves, and nosy neighbors. 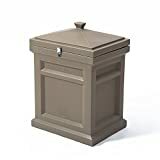 A delivery person simply inserts a package onto the rotating drum, closes the door, and it safely falls into a storage receptacle below - kinda like a mailbox. It's constructed from sturdy cast aluminum and heavy-gauge steel, securely bolts down to the pavement, and has a pry-resistant, 3-point locking system. It also features an outgoing partition for outbound shipments, a "No Deliveries" indicator, a vacation stopper lever, and comes in four powder coated decorative colors. A great peace-of-mind solution. Drop box locker has a rotating drum design that accepts parcels up to 11.5" x 9-1/3" x 7-1/3"